Vintage effect and fresh outsole. These are the new "Dupont Circle" elevator ankle boots by GuidoMaggi. Upper in light brown suede calf leather, hand tanned to give that extremely cool retro effect. The inner lining is made of soft goatskin. 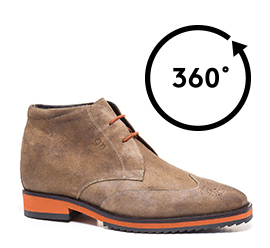 The handcrafted outsole, in 100% natural rubber with anti-slip is two coloured: orange and dark gray. The orange waxed laces recall the outsole. The insole and midsole are in genuine Italian leather. The inner height insole, made of natural rubber, can be selected between 2.4, 2.7 and 3.1 inches, depending on needs. The team of GuidoMaggi's artisans allows several possibilities for customization.